and dancing to echo the dialogue. 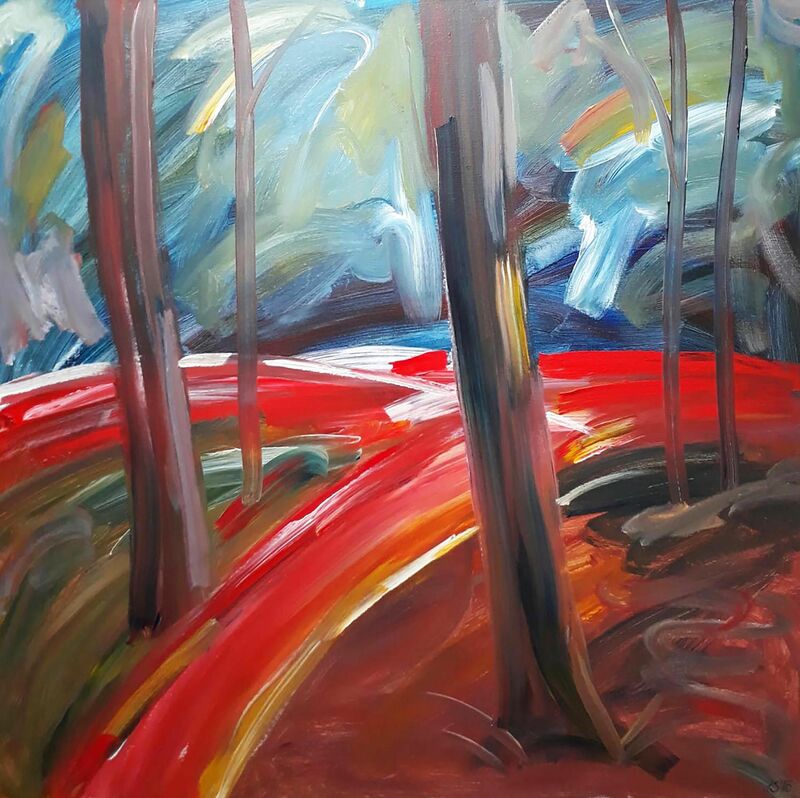 In this painting dynamic brushstrokes pick up, spread and mix the primary colours to suggest growth, depth and nature in organised chaos. 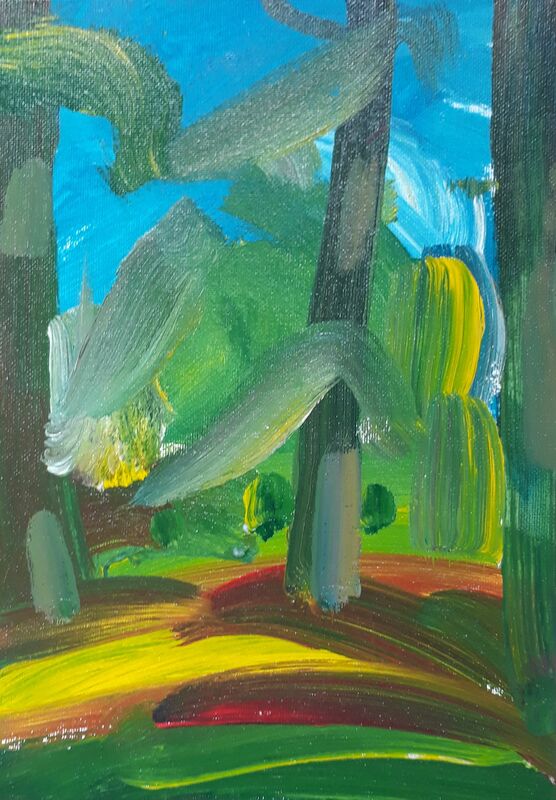 Brushstrokes dive and weave to echo the dynamic of trees plunging into and up from the forest bed, the dance into the dark depths where danger was once sensed, a wildness, a wilderness. 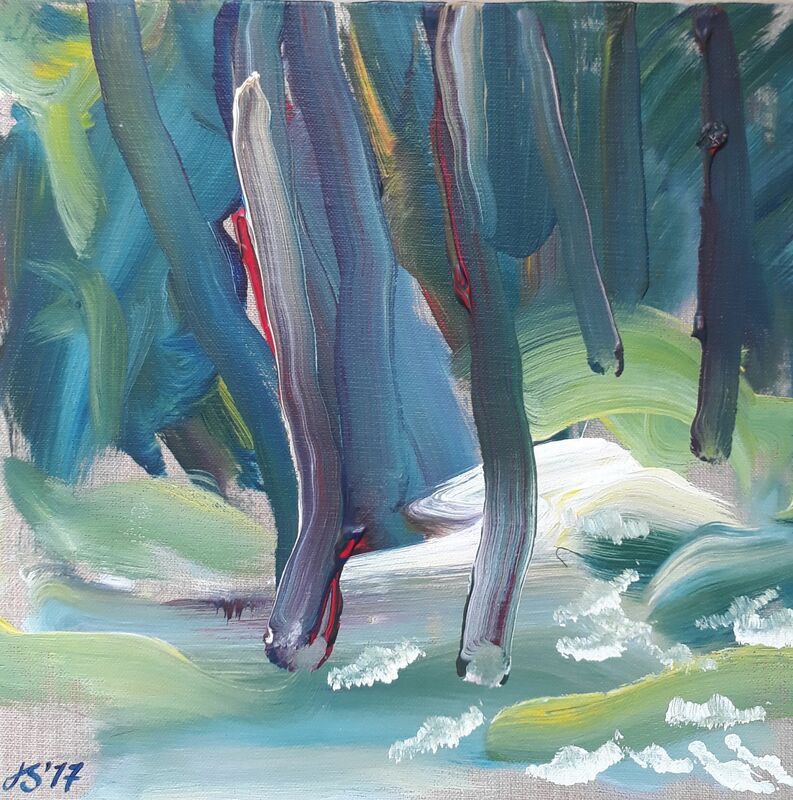 The bold brushstrokes and primary colour mix in this painting have been brought together to echo the music of the forest. The sound of growth, towering into blue infinity skies, sunlight dancing on fertile floors, branches and leaves shimmering together ... the wonderment of pure growth, nature organising itself to happen. 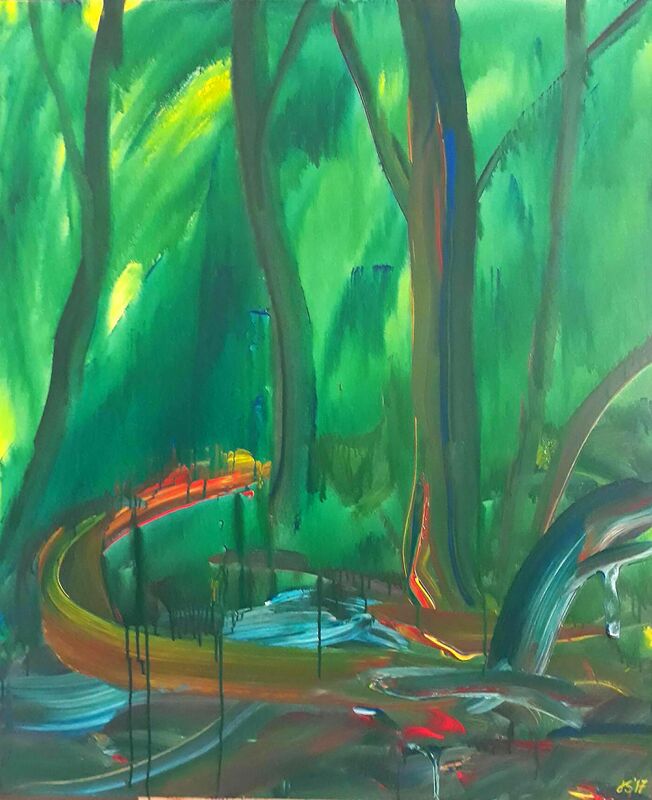 Forests make colour, colour makes music. It is the human race that lets itself and the environment down. Disrespect, destruction, decimation on a huge global scale, through forests, through greedy ravishing wars, through sheer indifference to other human beings and the environment itself. Inhuman behaviour dismissing nature and the very being of life itself ... disharmony that is damaging the world we should be harmonising with. 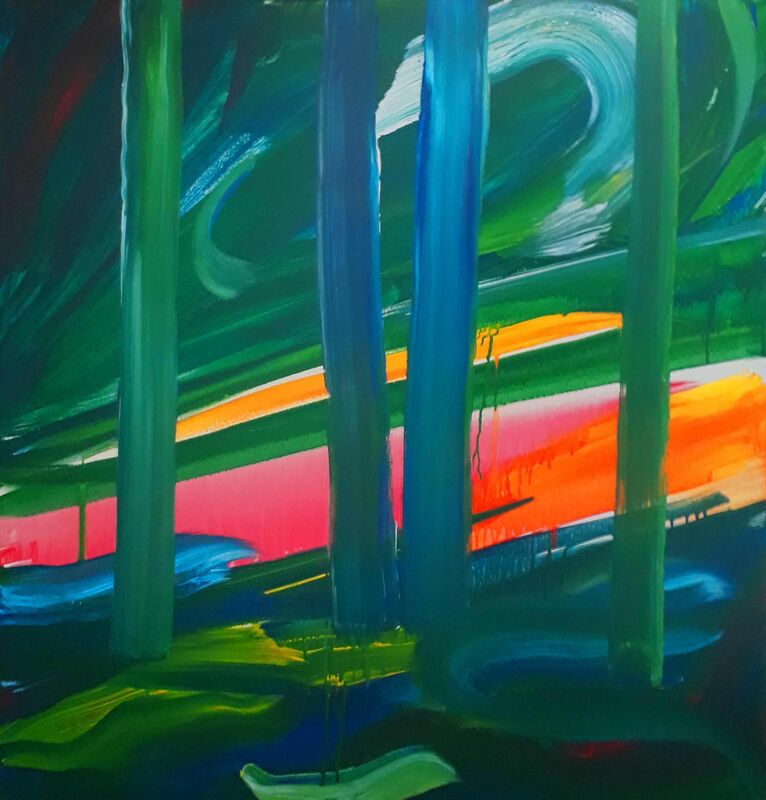 This painting sets out to capture the anger of the forest ... the anger of nature. The potential bloody scar left on the world by us humans. 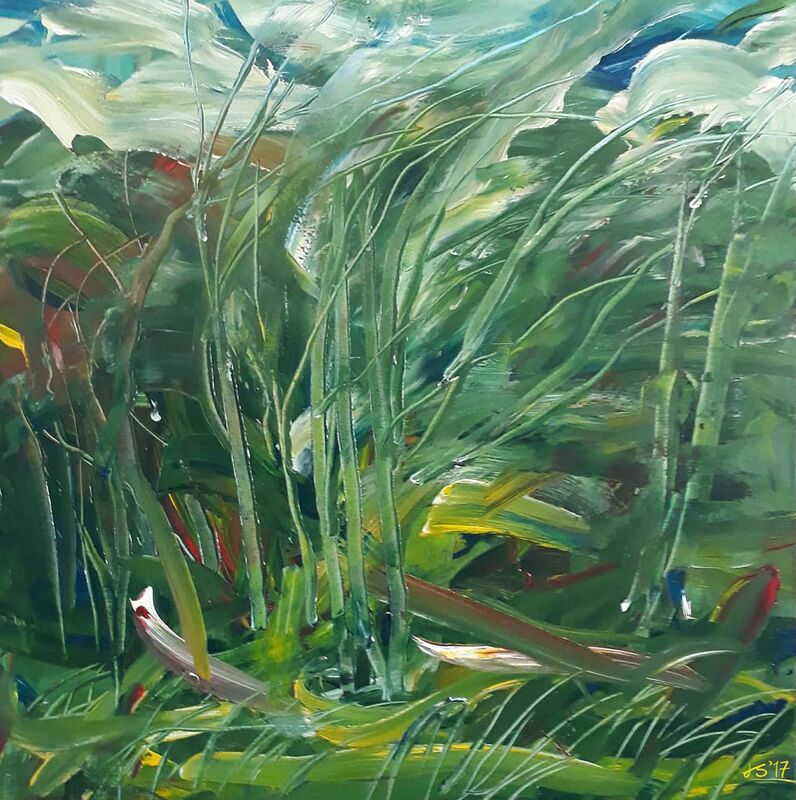 This painting expresses the element of wind ... it set out to capture the essence of natural movement ... trees dancing wildly ... branches writhing ... leaves wriggling out of control ... clouds billowing. The strength, determination and flexibility of nature as it is pulled, pushed and twisted by the elements. The sheer understanding of nature's huge power, the howling of the wind, the rhythm of the trees. This is about peace, energy, growth ... the calm, sun flooding in through leaves, trees awakening to the elements ... oozing life ... rinsed in colour ... sheer beauty but ... spoiled by the human path of potential destruction ... a curve of disrespect ... an ambiguity with nature ... the human route to destruction.